Fas is a member of the TNF receptor family. Binding of Fas ligand to Fas induces apoptosis in Fas-bearing cells. Fas is expressed in various cells, including thymocytes, peripheral T cells, and activated B cells. The mouse lpr mutation is a loss of function mutation of Fas. MRL-lpr/lpr mice develop lymphadenopathy and splenomegaly, and produce multiple autoantibodies, which results in autoimmune disease. In this report, we describe the establishment of a line of Fas transgenic MRL-lpr mice in which mouse Fas cDNA was expressed using the T cell-specific murine lck promoter. The transgenic mice expressed functional Fas in thymocytes and peripheral T cells, but not in B cells. The transgenic mice did not accumulate abnormal T cells (Thy-1+ B220+), but still accumulated B cells (Thy-1− B220+); they produced a large quantity of Igs (IgG1 and IgG2a), including anti-DNA Abs, and developed glomerulonephritis. These results suggest that autoreactive or activated B cells must be killed through Fas expressed in the B cells by the Fas ligand expressed in activated T cells. Homeostasis in the immune system is maintained not only by growth of lymphocytes but also by cell death. Fas ligand (FasL)4 is a type II membrane protein belonging to the TNF family (1, 2). It is predominantly expressed in activated T cells and NK cells (3, 4, 5). Fas, the receptor for FasL, is a type I membrane protein, and a member of the TNF receptor family (2, 6). It is expressed in various cells, including thymocytes, mature T cells, and activated B cells (3, 7, 8, 9). Binding of FasL to Fas induces apoptosis in Fas-bearing cells and kills them within hours (2). This is one of the effector systems of cytotoxic T cells and NK cells (10). Mice carrying the mutation of lymphoproliferation (lpr) or generalized lymphoproliferative disease (gld) develop lymphadenopathy and splenomegaly (11). They also produce large amounts of Igs, including anti-dsDNA or anti-ssDNA Abs, and suffer from autoimmune diseases such as nephritis and vasculitis, particularly in the mouse strain MRL. The lpr and gld mutations are loss of function mutations of Fas and FasL, respectively (12). Fas-null mice, established by gene targeting, show phenotypes that are more severe than the leaky lpr mutation (13). Human patients carrying mutations in Fas or FasL have also been identified (14, 15, 16, 17, 18, 19). They develop lymphadenopathy and splenomegaly and suffer from autoimmune disease caused by the production of autoantibodies (autoimmune lymphoproliferative syndrome) remarkably similar to those found in mouse lpr and gld mutants. Animals carrying the mutation in Fas or FasL accumulate cells that have the surface phenotypes Thy-1+ B220+ CD4− CD8− and are of T cell origin (11). The cells also express various activation Ags of T cells, such as CD69 and FasL (20, 21). The lymphoproliferation in the Fas-deficient animals is explained as follows. The activation of T cells by foreign Ags activates CD4+-type T cells to produce various lymphokines and cell surface molecules that stimulate the proliferation and differentiation of lymphocytes. CD8+ T cells are also activated by foreign Ags and kill the target cells. These activated T cells must be removed after they have accomplished their tasks. This deletion process, called activation-induced suicide of T cells, is mainly mediated by Fas and FasL (22, 23, 24). The activated T cells express FasL, which kills the activated cells by an autocrine or paracrine mechanism. The activated T cells in animals that have defects in Fas or FasL cannot undergo activation-induced suicide, and they accumulate in the periphery (20, 25). In contrast to the lymphoproliferation of T cells, it is not clear how animals that are deficient in Fas and FasL produce autoantibodies. Activated B cells express Fas, and they are sensitive to Fas-induced apoptosis. The number of B cells is increased in lpr and Fas-null mice (13, 26), and a large number of autoantibody-producing cells was found within the T cell zone of the spleen in lpr mice (27). From these results, it was suggested that the autoreactive B cells are killed through the interaction of FasL-expressing T cells with Fas-expressing B cells (28, 29). In this report we have established Fas transgenic MRL-lpr mice in which Fas was specifically expressed in T cells but not in B cells. The mice did not accumulate Thy-1+ B220+ T cells, yet produced large amounts of Igs, causing glomerulonephritis. These results indicate that lymphoproliferation of T cell origin and the production of autoantibodies are independent processes caused by defective Fas in T cells and B cells, respectively, and support the proposal that the autoreactive B cells are removed, at least in part, by Fas-mediated apoptosis. The expression vector, p1017 (30), carrying the proximal murine lck promoter and the human growth hormone gene sequence, was provided by Dr. R. M. Perlmutter (University of Washington, Seattle, WA). The coding sequence of mouse Fas cDNA (EcoRI-AccI fragment of pMF1) (31) was inserted into the BamHI site of p1017 using a BamHI linker, and the resulting construct was designated p1017Fas. The p1017Fas plasmid DNA was digested with NotI, and a 6.7-kb DNA fragment (5 ng/μl) carrying mouse Fas cDNA between the lck promoter and human growth hormone sequence was isolated. This fragment was microinjected into the pronuclei of fertilized eggs from MRL-lpr mice. Transgenic mice were screened by Southern blot analysis with mouse Fas cDNA as the probe, using tail DNA prepared as previously described (32). Two transgene-positive lines were established by backcrossing founder animals with MRL-lpr mice. The presence of the transgene in progenitors was followed by PCR analysis of tail DNA, using Fas cDNA-specific primers, the sense primer P (5′-GGAATTCCGCTGTTTTCCCTTGCTGCA-3′) and the antisense primer ER (5′-CACAGTGTTCACAGCAGGA-3′). The conditions for PCR were described previously (33). MRL/MpJ-lpr/lpr (MRL-lpr) mice were purchased from SLC (Shizuoka, Japan). All mice were maintained under specific pathogen-free conditions in an animal facility at the Osaka Bioscience Institute. Cell suspensions were prepared from the lymphoid organs of 5-wk-old mice as previously described (34). Splenocytes were depleted of erythrocytes by treatment for 1 min at room temperature with a lysis buffer (140 mM NH4Cl and 17 mM Tris-HCl (pH 7.2) containing 0.5% FCS (Life Technologies, Gaithersburg, MD). To activate B cells, the splenocytes were treated at 37°C for 48 h with 50 μg/ml LPS (Escherichia coli 026; B6, Sigma, St. Louis, MO) in RPMI 1640 medium supplemented with 10% FCS, 300 μg/ml l-glutamine, and 50 μM 2-ME. Naive or activated lymphocytes (1–10 × 105 cells) were washed twice in staining solution (PBS containing 2% FCS and 0.02% sodium azide), incubated for 5 to 10 min at 4°C with anti-FcγII/III receptor Abs (2.4G2, PharMingen, San Diego, CA), and stained for 30 min at 4°C with Abs in staining solution. The Abs used were phycoerythrin (PE)-conjugated anti-Fas (Jo2; PharMingen); FITC-, biotin-, or PE-conjugated anti-Thy-1.2 (53-2.1; PharMingen); FITC- or PE-conjugated anti-B220 (RA3-6B2; PharMingen); FITC-conjugated anti-CD8a (53-6.7; PharMingen); FITC- or PE-conjugated anti-CD4 (RM4-5; PharMingen); and biotin-conjugated F(ab′)2 of goat anti-mouse IgM Ab (μ-chain specific; Cappel Laboratories, Durham, NC). After staining, the cells were washed twice and, if necessary, were stained with PerCP-streptavidin (Becton Dickinson, San Jose, CA). The dead cells were stained with FITC-conjugated annexin V (R&D Systems, Minneapolis, MN) or propidium iodide, and flow cytometric analysis was performed on a FACScan flow cytometry (Becton Dickinson). The data were analyzed using CellQuest software (Becton Dickinson). To produce the soluble mouse FasL (mFasL), BTS1 cells (monkey CV1 cells carrying the temperature-sensitive SV40 T Ag) (35) were transformed with a mouse FasL expression plasmid, pEFMFLWX1 (34), as described previously (36). The transformants were maintained in DMEM containing 10% FCS at the nonpermissive temperature of 39.5°C. To generate culture supernatant fractions containing mFasL, the cells were grown for 4 days at 33°C in DMEM containing 10% FCS, and mFasL was affinity purified using hamster mAbs against mouse FasL (T. Suda and K. Miwa, unpublished results). The cytotoxic activity of mFasL was determined using mouse W4 cells as targets as previously described (34). The purified mFasL had a sp. act. of 3 × 106 U/mg protein. To determine their susceptibility to FasL-induced apoptosis, thymocytes or splenocytes from 5-wk-old mice were incubated at 37°C with various concentrations of mFasL in RPMI 1640 supplemented with 10% FCS, 300 μg/ml l-glutamine, and 50 μM 2-ME, and the dead cells were quantified by flow cytometric analysis using FITC-conjugated annexin V (R&D Systems) according to the instructions provided by the manufacturer. Sera were prepared from 5- to 7-mo-old mice, and IgG1 and IgG2a in the sera were quantified by single radial immunodiffusion using an Ig assay kit (Serotec, Oxford, U.K.). The serum levels of the anti-dsDNA Abs were determined using an ELISA. In brief, pUC19 plasmid DNA was linearized with EcoRI. The DNA (5 μg/ml) was immobilized on CovaLink plates (37) (Nunc, Copenhagen, Denmark) by treatment at 50°C for 5 h with 150 mM 1-ethyl-3-(3-dimethylaminopropyl)-carbodiimide in 10 mM 1-methylimidazole, pH 7.0. The plates were extensively washed with 5× SSC (1× SSC is composed of 150 mM NaCl and 15 mM sodium citrate) containing 0.25% SDS at 55°C. Nonspecific binding sites on the DNA-coated plates were blocked by incubation for 60 min at room temperature with blocking solution (Tris-buffered saline (10 mM Tris-HCl, pH 7.4, and 140 mM NaCl) containing 1% BSA and 3 mM EDTA). Mouse sera were diluted 100 times with the blocking solution, and 50-μl aliquots were applied to the DNA-coated plates and incubated for 60 min at room temperature. After washing three times with the washing buffer (Tris-buffered saline containing 0.1% Nonidet P-40, 3 mM EDTA, and 1% gelatin), the plates were incubated for 60 min with peroxidase-conjugated goat anti-mouse Igs (Cappel) at a dilution of 1/4000. The peroxidase activity was detected using o-phenylenediamine as a substrate with a peroxidase-detecting kit (Sumitomo, Tokyo, Japan), and the absorbance was measured at 492 nm using a MicroElisa reader (Titertek Instruments, Huntsville, AL). Kidneys from 5- to 7-mo-old mice were fixed with 4% paraformaldehyde in 0.1 M phosphate buffer, pH 7.2, containing 4% sucrose and embedded in paraffin. Sections (4 μm thick) were prepared with a Microtome (Yamato Kohki, Saitama, Japan), mounted on silanized slide glasses, and deparaffinized. For immunohistochemistry, sections were incubated for 60 min at room temperature in PBS containing 0.1% Triton X-100 and 10% normal goat serum and were stained for 60 min at room temperature with Cy3-conjugated F(ab′)2 of goat anti-mouse IgG (Jackson ImmunoResearch Laboratories, West Grove, PA) used at a dilution of 1/100. The sections were then washed three times with PBS containing 0.1% Triton X-100 and observed by the fluorescence microscopy (IX-70, Olympus, Melville, NY). The murine lck proximal promoter works specifically in T cells, in particular in thymocytes (30). To express Fas specifically in T cells, murine Fas cDNA was placed under the control of the lck promoter in a p1017 expression vector (30). This vector carries not only the lck promoter, but also introns and exons of the human growth hormone gene. The human growth hormone sequence is in the noncoding sequence of the transgene and is used to increase the transgene expression (30). Transgenic animals were generated by the injection of MRL-lpr mouse embryos with the 6.7-kb NotI fragment of p1017Fas. Two independent lines of Fas transgenic mice were established, and one of them was analyzed in detail. Fas is expressed rather ubiquitously, with abundant expression in thymus, liver, and heart (31). The lpr mice carry a rearrangement in the Fas gene and hardly express Fas (38, 39). When tissues of Fas transgenic mice were analyzed by Northern hybridization with mouse Fas cDNA as the probe, the transgenic Fas mRNA of 3.9 kb was very strongly detected in the thymus and was weakly detected in the spleen (data not shown). No transgenic Fas mRNA was detected in other tissues, such as heart and liver. To examine which populations of lymphoid cells express Fas, the thymocytes, splenocytes, and lymph node cells were analyzed by flow cytometry. As shown in Figure 1⇓A, thymocytes from wild-type mice uniformly expressed Fas, but no significant Fas expression was observed in thymocytes from lpr mice. On the other hand, most of the thymocytes from the Fas transgenic mice expressed Fas, although its expression level was heterogeneous and slightly reduced compared with that in wild-type mice. Similarly, the splenic naive T cells from wild-type, but not lpr, mice expressed Fas (Fig. 1⇓B). The Fas transgenic mice expressed Fas in splenic T cells, and its expression level was higher and more heterogeneous than that in wild-type mice. There was no significant difference in Fas expression level between CD4+ and CD8+ thymocytes or mature T cells from Fas transgenic mice (data not shown). Resting naive B cells did express a low level of Fas, but its expression could be induced by activation (7, 8, 9). As shown in Figure 1⇓C, when the splenocytes were treated with LPS, the B cells (IgM+ cells) from wild-type mice expressed Fas on their surfaces. A similar treatment of splenocytes from the lpr or Fas transgenic mice did not induce Fas expression in B cells. A similar result was obtained with lymph node cells. These results indicate that the Fas transgenic lpr mice specifically express Fas in thymocytes and mature peripheral T cells, but not in B cells. Expression of Fas in lymphoid cells. Thymocytes and splenocytes were prepared from wild-type (thin line), transgenic (thick line), and lpr (dotted line) mice at age of 5 wk. A, Expression of Fas in thymocytes. Thymocytes were stained with PE-conjugated anti-Fas Abs and were analyzed by flow cytometry as described in Materials and Methods. B, Expression of Fas in naive T cells. Freshly isolated splenocytes were stained with PE-conjugated anti-Fas Abs and biotin-conjugated anti-Thy-1.2 Abs. The cells were then stained with PerCP-conjugated streptavidin and analyzed by flow cytometry. The Fas expression in the Thy-1+ cells is shown. C, Splenocytes were incubated at 37°C for 52 h with LPS and stained with PE-conjugated anti-Fas Abs and biotin-conjugated anti-mouse IgM Abs as described above. The Fas expression of IgM+ cells is shown. We then examined whether the Fas expressed in transgenic mice was functional. Previously, we showed that a recombinant mFasL (WX1) has a strong cytotoxic activity against thymocytes and naive T cells (34). We used this mFasL-induced cytotoxicity as an assay for the presence of functional Fas. First, we confirmed our previous result with thymocytes and splenic T cells from MRL mice. As shown in Figure 2⇓, A and B, the thymocytes and naive T cells from spleens of wild-type MRL mice were sensitive to mFasL-induced apoptosis. In contrast, the thymocytes and naive T cells from lpr mice were not killed by mFasL; however, those from the Fas transgenic mice were effectively killed. As previously observed (8, 9), the activated B cells from wild-type mice were sensitive to the Fas-induced apoptosis, and >70% of the cells were killed within 24 h by mFasL (Fig. 2⇓C). On the other hand, the LPS-activated B cells from lpr or Fas transgenic mice were resistant to mFasL-induced cell death. These results indicate that Fas expressed in the thymocytes and peripheral T cells in Fas transgenic mice was functional, but the mature B cells in these animals could not be killed by the Fas-dependent apoptotic system. FasL-induced apoptosis of lymphocytes. 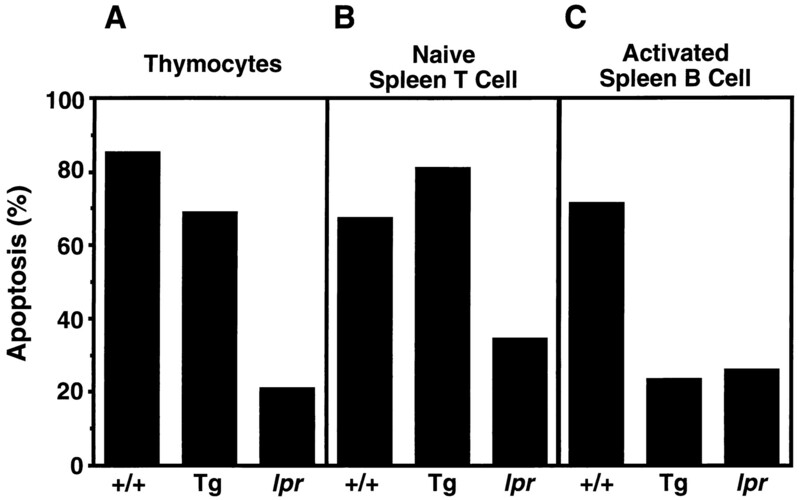 Thymocytes (A), naive splenocytes (B), and splenocytes activated with LPS (C) from wild-type (+/+), transgenic (Tg), and lpr (lpr) mice at 5 wk of age were incubated at 37°C for 3 h (A and B) or 24 h (C) with 5000 U/ml of mFasL. Thymocytes (A) were stained with annexin V alone, while naive and activated splenocytes were stained with annexin V together with anti-Thy-1 (B) or anti-IgM Abs (C) to represent T cells and B cells, respectively. The percentages of the annexin V-positive dead cells were then determined using a flow cytometer. MRL-lpr mice develop lymphadenopathy and splenomegaly in an age-dependent manner. As shown in Figure 3⇓, the size of the lymph nodes of MRL-lpr mice was more than 40 times larger than that of the wild-type mice at 17 wk of age. This lymphadenopathy was greatly diminished in Fas transgenic mice (Fig. 3⇓). The size of the lymph nodes in the transgenic mice was at most twice that in the wild-type mice. Similarly, the spleens of MRL-lpr mice were about 5 times larger than those of the wild-type mice at 17 wk of age. However, the spleens in Fas transgenic mice were, on the average, about 1.7 times larger than those in wild-type mice. The slight splenomegaly of the Fas transgenic mice was mainly due to the increased number of B cells (see below). No lymphadenopathy in MRL-lpr mice expressing Fas in T cells. The axially and inguinal lymph nodes were excised from wild-type (+/+), transgenic (Tg), and lpr mice at the ages of 9 and 17 wk, and the average weights of five or six mice are shown as tissue weights (milligrams) per body weight (grams). SD values are indicated by bars. The cells that cause the lymphadenopathy and splenomegaly in MRL-lpr mice are abnormal T cells that express Thy-1 and B220, but neither CD4 nor CD8. As shown in Figure 4⇓, 76% of lymphocytes in the lymph nodes of lpr mice at 17 wk of age were these abnormal T cells. In contrast, the abnormal T cells in Fas transgenic mice were only 6% of the total. When the total number of abnormal lymphocytes was calculated, the prevention of lymphoproliferation in Fas transgenic mice was more apparent. As shown in Table I⇓, a total of 1.1 × 109 Thy-1+ B220+ abnormal T cells were found in the lymph nodes of lpr mice. This population decreased to 6.6 × 105 (1600-fold less) in Fas transgenic mice. Flow cytometric analysis of lymphocytes from lymph nodes. Lymphocytes from the lymph nodes of wild-type (+/+), transgenic (Tg), and lpr mice at the age of 17 wk were stained with FITC-conjugated anti-Thy-1.2 and PE-conjugated anti-B220 Abs. In each instance, 5000 viable cells were analyzed by flow cytometry. Numbers indicate the percentages of positively stained cells in each quadrant. At least three mice for each genotype were analyzed. Although the population of B220+ Thy-1+ abnormal T cells was greatly reduced in Fas transgenic mice, the population of B220+ Thy-1− cells was still higher in the lymph nodes of the transgenic animals. At 17 wk of age, this population of the cells was 3% in the lymph nodes of the wild-type mice, and 35% in the transgenic mice (Fig. 4⇑). Accordingly, the absolute number (6.1 × 106 cells) of B220+ Thy-1− cells in the lymph nodes in Fas transgenic mice was about 40 times higher than that in the wild-type mice (Table I⇑). 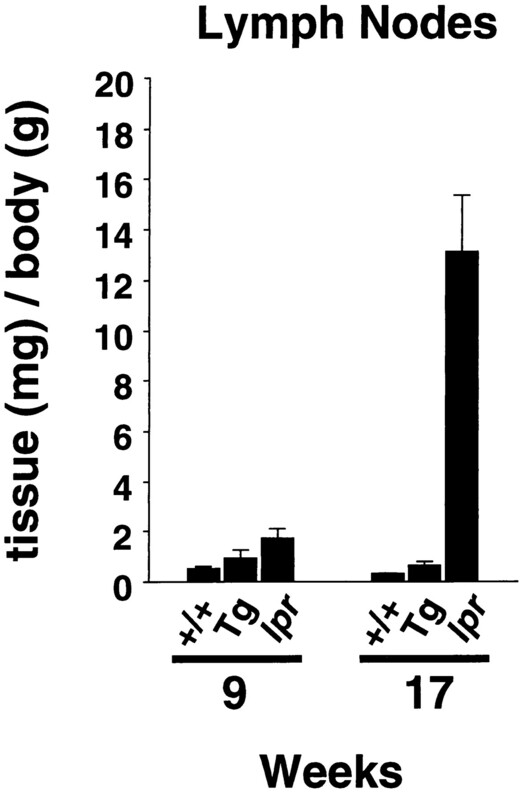 These B220+ Thy-1− cells appear to be normal B cells, since they also express IgM on their surface (data not shown). The accumulation of these cells was observed even in younger animals; that is, the population of B220+ Thy-1− cells in the lymph nodes of Fas transgenic mice was 56% at 9 wk of age, while that of the wild-type mice was 4% (data not shown). In contrast to the B cells, the accumulation of normal T cells in lpr mice was almost completely rescued by expressing Fas in the T cells. As shown in Table I⇑, the number of apparently normal T cells (Thy-1+ B220−) was about 24 times higher in lpr mice than in wild-type mice, whereas, the number of T cells in the lymph nodes of Fas transgenic mice was almost comparable to that of the wild-type mice. From these results, we concluded that the loss of function mutation of Fas in lpr mice causes lymphoproliferation not only of T cells but also of B cells. The expression of Fas in T cells in the Fas-transgenic lpr mice prevents the accumulation of T cells but not that of B cells. 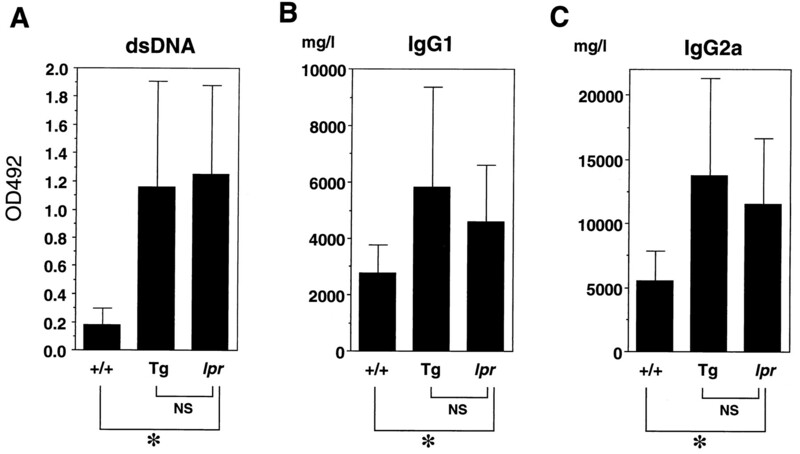 MRL-lpr mice produce a large quantity of pathogenic IgG1 and IgG2a autoantibodies and show autoimmune diseases such as glomerulonephritis and vasculitis (11, 40). To examine whether the expression of Fas in T cells, but not that in B cells, affects autoimmunity in lpr mice, we compared the levels of serum Igs and autoantibodies. As shown in Figure 5⇓, B and C, the serum levels of IgG1 and IgG2a in lpr mice at 5 to 7 mo of age were 2 to 3 times higher than those in age-matched wild-type mice. This abnormal production of Igs in lpr mice was more pronounced when the levels of the autoantibodies in the serum were compared. As shown in Figure 5⇓A, the level of Abs against dsDNA in lpr mice was 5 to 6 times higher than that in wild-type mice. This high level of Igs and autoantibodies was not diminished in the Fas transgenic mice (Fig. 5⇓). Production of Igs and autoantibodies. Sera were collected from 17- to 30-wk-old wild-type (+/+), transgenic (Tg), and lpr mice. The concentrations of anti-dsDNA (A), IgG1 (B), and IgG2a Abs (C) were determined as described in Materials and Methods. Results are shown as means of the values obtained from 12 to 16 mice. SD values are indicated by bars. MRL-lpr mice develop glomerulonephritis, which is caused by the deposit of immune complexes in the glomeruli. In fact, when the kidneys of the lpr mice were immunohistochemically analyzed with anti-Ig Abs, the glomerulus was strongly positive (Fig. 6⇓). Histologic examination revealed symptoms of renal disease, namely glomerulonephritis with hypercellularity, lobularity, and focal sclerosis (data not shown). The deposit of Igs in the glomeruli was not observed in age-matched wild-type MRL mice, but it was observed in glomeruli of the Fas transgenic mice (Fig. 6⇓). Furthermore, glomerulonephritis in the Fas transgenic mice was as severe as that in lpr mice. From these results, we concluded that the defect of Fas in B cells leads to the accumulation of B cells producing autoantibodies, which causes autoimmune diseases such as glomerulonephritis. 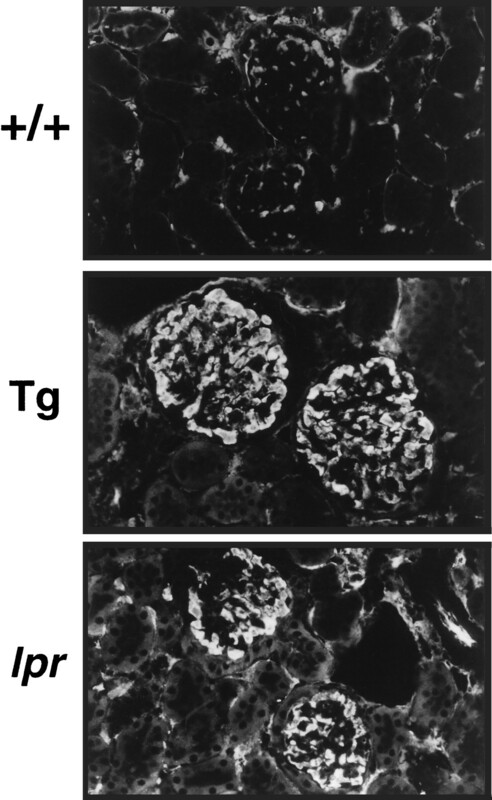 Development of glomerulonephritis. The kidney sections were prepared from the wild-type (+/+), transgenic (Tg), and lpr mice at the age of 6 mo. The sections were stained with Cy3-conjugated anti-mouse IgG and observed using fluorescence microscopy. Original magnification, ×200. In this report we describe the establishment of a line of Fas transgenic MRL-lpr mice that express Fas specifically in T cells. To express Fas specifically in T cells, we have used the mouse lck proximal promoter. The lck promoter was originally reported to operate predominantly in thymocytes (30). In fact, Northern hybridization indicated that while the transgenic Fas mRNA was very strongly expressed in the thymus, it was very weakly expressed in spleen and lymph nodes. However, when Fas protein expressed on cell surfaces was analyzed by FACS, significant expression was found not only in thymocytes but also in the mature T cells of the transgenic mice, suggesting that Fas expression is also regulated post-transcriptionally in lymphocytes. The transgenic Fas expressed in thymocytes and peripheral T cells was functional, as the cells were efficiently killed by the soluble FasL. On the other hand, in agreement with the tight specificity of the lck promoter for T cells, the B cells of the transgenic mice did not express Fas. The activated B cells, which normally are sensitive to Fas-induced apoptosis (9), remained resistant, as found with those from lpr mice. The T cell-specific expression of the transgenic Fas almost completely prevented accumulation of Thy-1+, B220+ cells, while the production of autoantibodies and the occurrence of autoimmune diseases such as glomerulonephritis were still observed. Recently, Komano and Shinohara established a line of Fas transgenic MRL-lpr mice that specifically expresses Fas in B cells (N. Shinohara, unpublished observations). These mice developed lymphadenopathy and splenomegaly, but they neither produced autoantibodies nor developed autoimmune disease. Moreover, when Fas was expressed in both T cells and B cells in MRL-lpr mice, neither lymphoproliferation nor autoimmune disease was observed (H. Fukuyama and S. Nagata, unpublished observation). These results indicate that the lymphoproliferation of Thy-1+ B220+ cells and the production of autoantibodies in MRL-lpr mice are distinct processes. The defect of Fas in T cells causes lymphoproliferation, while the defect of Fas in B cells is responsible for the production of autoantibodies and autoimmune diseases, although the abnormal T cells in lpr mice may further accelerate the disease. This result is in contrast to the previous report by Wu et al. (41) in which they claim that the expression of Fas in the T cells of MRL-lpr mice is sufficient to correct the autoimmune disease. They used the mouse CD2 promoter to express Fas in T cells. Since the expression of CD2 is not strictly restricted to the T cells (42, 43), we think that their transgenic mice expressed Fas not only in T cells but also in B cells. Chimeras containing a mixture of lpr- and normal-derived lymphoid cells were also constructed. Since the injection of anti-Thy 1 Ab specifically recognizing the lpr T cells rescued the autoimmune disease, Sobel et al. (44) concluded that lpr T cells are responsible for the production of autoimmune Abs. The transgenic mice expressing Fas in T cells carry 1600-fold less Thy-1+ B220+ T cells than lpr mice, but this number is still 15 times higher than that found in wild-type mice. Whether these abnormal T cells contribute to the production of autoantibodies in the transgenic mice remains to be studied. How does the defect of Fas in B cells lead to the production of autoantibodies? B cells present Ags to CD4 T cells and activate them to express CD40 ligand and FasL. The CD40 ligand then activates the B cells to express Fas and makes them sensitive to Fas-induced apoptosis (7, 8, 28). When B cells are simultaneously activated by Ags through the B cell receptor, they become resistant to Fas-induced apoptosis and undergo clonal expansion to produce Abs (28, 29). On the other hand, autoreactive B cells are desensitized for activation through the Ag receptor due to chronic binding of the Ag and remain sensitive to Fas-induced apoptosis (29, 45). Since Th1-type CD4+ T cells predominantly express FasL (3, 46), it is likely that Th1 T cells are mainly responsible for removing autoreactive B cells. Human patients deficient in the CD40 ligand and mice deficient in the lyn oncogene produce autoantibodies and suffer from autoimmune diseases (47, 48, 49) similar to those observed in the MRL-lpr transgenic mice expressing Fas in T cells. The Lyn kinase is involved in signal transduction from CD40, and the inability of B cells to express Fas in lyn-null mice has recently been demonstrated (50). In addition, the autoimmune diseases in MRL-lpr mice were shown to occur by non-αβ T cells by a CD40 ligand-dependent or -independent mechanism (51). It will be interesting to examine whether the autoimmune disease (renal failure) in the Fas transgenic mice is caused by αβ T cells or non-αβ T cells, and whether it is CD40 ligand dependent. In any case, our results agree with the proposal that T cells not only help B cells to proliferate and differentiate, but also kill them through the Fas/FasL system (45). In addition to autoreactive B cells, B cells reactive to foreign Ags undergo apoptosis upon activation in the germinal centers (52). Whether the cell death of these B cells is mediated by Fas and FasL remains to be studied. The availability of mice that express Fas in T cells but not in B cells will help in examining the possible involvement of Fas in this process. We are grateful to Dr. Roger M. Perlmutter (University of Washington, Seattle, WA), for the p1017 vector. We thank Ms. H. Fujiwara and S. Kumagai for secretarial assistance. ↵1 This work was supported in part by grants-in-aid from the Ministry of Education, Science, and Culture of Japan, and by Special Coordination Funds from the Science and Technology Agency of the Japanese Government. ↵2 Present address: The Burnham Institute, 10901 N. Torrey Pines Rd., La Jolla, CA 92037. ↵4 Abbreviations used in this paper: FasL, Fas ligand; gld, generalized lymphoproliferative disease; lpr, lymphoproliferation; PE, phycoerythrin; mFas, mouse Fas.